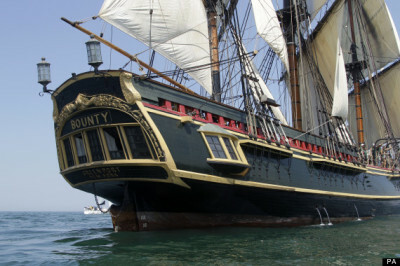 HMS Bounty, also known as HM Armed Vessel Bounty, was a small merchant vessel purchased by the Royal Navy for a botanical mission. The ship, under the command of William Bligh, was sent to the Pacific Ocean to acquire breadfruit plants and transport them to British possessions in the West Indies. That mission was never completed, due to a mutiny led by Acting Lieutenant Fletcher Christian. This was the famous Mutiny on the Bounty. Some 1,300 miles (2,100 km) west of Tahiti, near Tonga, mutiny broke out on 28 April 1789. 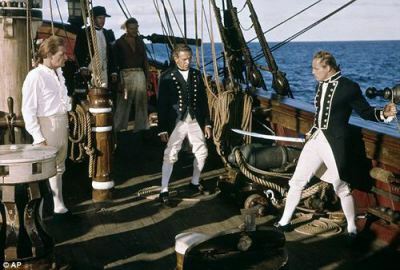 Despite strong words and threats heard on both sides, the ship was taken bloodlessly and apparently without a struggle by any of the loyalists except Bligh himself. Of the 42 men on board aside from Bligh and Christian, 22 joined Christian in mutiny, two were passive, and 18 remained loyal to Bligh. 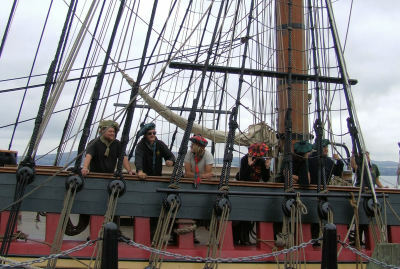 The mutineers ordered Bligh, two midshipmen, the surgeon's mate (Edward), and the ship's clerk into the vessel's boat. Several more men voluntarily joined Bligh rather than remain aboard. they returned to Tahiti. 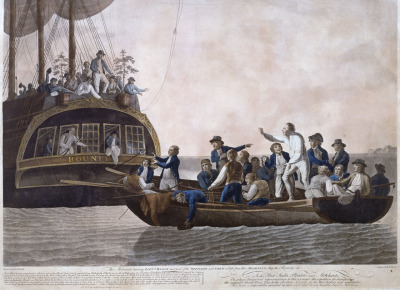 Sixteen of the mutineers - including the four loyalists who had been unable to accompany Bligh - remained there, taking their chances that the Royal Navy would find them and bring them to justice. HMS Pandora was sent out by the Admiralty in November 1790 in pursuit of the Bounty, to capture the mutineers and bring them back to England to face a court martial. 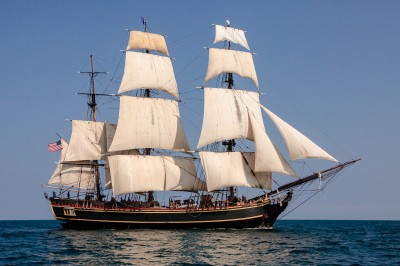 She arrived in March 1791 and captured fourteen men within two weeks; they were locked away in a makeshift wooden prison on the Pandora's quarterdeck. The men called their cell "Pandora's box". They remained in their prison until 29 August 1791 when the Pandora was wrecked on the Great Barrier Reef with the loss of 35 lives; four of them (Stewart, Sumner, Skinner and Hildebrand) were mutineers. 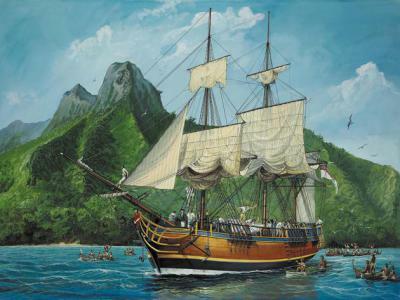 Immediately after setting the sixteen men ashore in Tahiti in September 1789, Fletcher Christian, eight other crewmen, six Tahitian men, and 11 women, one with a baby, set sail in Bounty hoping to elude the Royal Navy. After the decision was made to settle on Pitcairn, livestock and other provisions were removed from Bounty. To prevent the ship's detection, and anyone's possible escape, the ship was burned on 23 January 1790 in what is now called Bounty Bay. HMS Blossom on a voyage of exploration under Captain Frederick William Beechey, arrived on Christmas Day off Pitcairn and spent 19 days there. Captain Beechey later recorded this in his 1831 published account of the voyage, as did one of his crew, John Bechervaise, in his 1839 Thirty-Six years of a Seafaring Life by an Old Quarter Master. Beechey wrote a detailed account of the mutiny as recounted to him by the last survivor, Adams. Bechervaise, who described the life of the islanders, says he found the remains of Bounty and took some pieces of wood from it which were turned into souvenirs such as snuff boxes.